Pencil-and-paper division, also known as long division, is the hardest of the four arithmetic algorithms. Like the other algorithms, it requires you to solve smaller subproblems of the same type. But unlike the other algorithms, there is no limited set of “facts” that solve all possible subproblems. Solving these division subproblems requires estimation, guessing, and checking. In addition to these division subproblems, multiplication and subtraction are required as well. Multiply: Multiply the quotient (a single digit) by the divisor. Bring down: Copy down the next digit of the dividend to form the new working portion. Does 88 go into 8? No, because it’s greater than 8. Does 88 go into 83? No, because it’s greater than 83. Does 88 go into 831? Yes, because it’s less than or equal to 831. Bring down: Bring down the 2 to make 392. Divide: Does 88 go into 392? Yes, 4 times. Multiply: 4 x 88 = 352. Subtract: 392 – 352 = 40. Bring down: Bring down the implied trailing 0 to make 400. Divide: Does 88 go into 400? Yes, 4 times. Subtract: 400 – 352 = 48. Bring down: Bring down the implied trailing 0 to make 480. Divide: Does 88 go into 480? Yes, 5 times. Multiply: 5 x 88 = 440. Subtract: 480 – 440 = 40. Stop the presses! We tried to divide 400 by 88 before — two steps ago. That means we have a two-digit cycle (45) from here on out. The answer is 9.445. The red digits are the carries that occur during the multiplication substeps (the multiplication is done as if the divisor — the bigger number — is on top, by convention). Each red digit is crossed out before the next multiplication. To avoid clutter, I have chosen not to mark the borrows that occur during subtraction. My example has a multi-digit divisor, and has an answer with a remainder that I wrote as a repeating decimal. I wanted one example that showed long division to its fullest. I could have picked a problem with a single-digit divisor (which would require no guessing, assuming you know the multiplication facts), or one that produced an integer quotient, or one that produced a quotient with a fractional part that terminated. I could have expressed the fractional part as an integer remainder, or in fraction form. If the divisor or dividend is negative, you can remove the signs and apply the appropriate sign to the answer at the end. 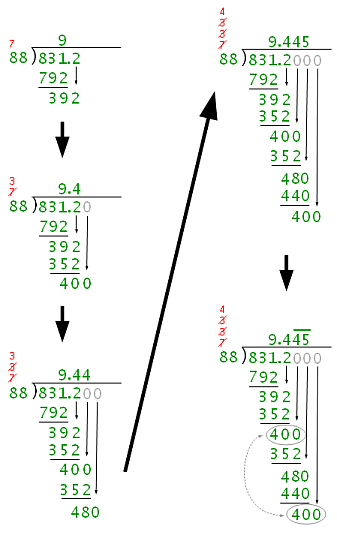 If the divisor has a decimal point, shift the decimal point right until the divisor is an integer, and shift the dividend by the same number of places. If the divisor is greater than the dividend, just proceed with the algorithm as is. Trailing zeros will be brought down to form the appropriate subproblems. Divide: Does 11 go into 101? (Yes, we already know that from step 0.) How many times does it go in? One time. There is no guessing. It’s easy to see 11 is less than 101, so we know it goes in. And if it goes in, it goes in only once. Subtract: 101 – 11 = 10. Bring down: Bring down the 1 to make 101. Divide: Does 11 go into 101? Yes, 1 time. Multiply: 1 x 11 = 11. Bring down: Bring down the 0 to make 100. Divide: Does 11 go into 100? Yes, 1 time. Subtract: 100 – 11 = 1. Bring down: Bring down the 0 to make 10. Divide: Does 11 go into 10? No (write down a 0). We stop here, recognizing that we divided 100 by 11 two steps ago. This means we have a two-digit cycle (10) from here on out. The quotient is 11.1110. When the answer has a repeating fractional part, checking it is not as straightforward as it is for the other arithmetic operations. What we can do is approximate the quotient to a finite number of places and then check that it comes close to the expected answer. You can check the answer in a few ways. One way is by doing binary multiplication by hand: you verify that the approximated quotient (11.11101011, for example) multiplied by the divisor (11) equals the dividend (1011.11). (I’ll leave that as an exercise, but the answer is 1011.11000001, which is very close to 1011.11). Another way to check is to convert the operands to decimal, do decimal division, and then convert the approximate decimal answer to binary. 1011.11 = 11.75, and 11 = 3. 11.75/3 = 3.916. Estimating that as 3.91666666666666667, for example, my binary converter says it equals 11.111010101010101010101010101010101010 when truncated to 36 places. That looks like it wants to be 11.1110, the answer we got using binary division. You can also check the answer using my binary calculator. It says 1011.11/11 is 11.111010101010 (to 12 places, for example). Again, that looks like 11.1110. You can also use this tool to convert in the opposite direction, verifying that 3.916 converts to 11.1110. Like the other arithmetic algorithms, I described the division algorithm in a base-independent way. I wanted to stress the mechanical procedure, not why it works (in either decimal or binary). When you do binary long division, you might find yourself doing some of the substeps in your head in decimal (e.g., 101 – 11 is 5 – 3 = 2, which is 10 in binary). If you play around with binary division you’ll see that it produces more repeating fractional numbers than decimal division does. For example, 2/5 = 0.4, but 10/101 = 0.0110. Now all that’s left for me to learn (somehow) is exponentiation, which is just repeat multiplication, BUT … including decimal exponents [rooting]. In otherwords, (decimal) 5 ^ 2.25 / (binary) 101 ^ 10.01 (which is really 25 * quadroot(5)). That’d be me (Rick). You’re welcome. how to divide this binary number 100110/10.11 ????????? That example fits the second bullet of my “Other Cases” heading: just shift the decimal point so the division is 10011000/1011. One thing very impressive to me is the presentation image of “Steps of Decimal Division”. Can you share which tool is used to produce it? I also like the image in “shortest numbers round trip”. It is very clear. Thanks, Rick. You gives so quick response. Recently I read several of your articles. Very well written and useful. I can post some testing I have done with some of your programs. One thing I find, on Ubuntu 64 v13.10, dtoa() from David M. Gay caused dead loop compiled by gcc test.c. However, it does work fine with gcc -m32 test.c to create 32bit code. The issue seems due to integer size. As for binary add/sub/mul/div, I write Perl script using Math::BigFloat to convert binary to decimal, do the math operation and convert back to binary bits. Kind of cheating. I implement my binary calculator by “cheating” as well. I don’t understand your “dead loop” comment. Maybe you can email me with details (see my contact page) or continue this discussion on one of my David Gay articles. THANKS A LOT, RICK REGAN, I USED YOUR ALGORITHM TO TEACH MY STUDENTS BINARY DIVISION. You’re welcome — thanks for the feedback. It’s just a few steps and I could work it out for you; but let me ask you this first: is there something about my description you didn’t understand? I’d like to clear that up if so. Your explanation is very clear, however I’m puzzled by those numbers that you are placing above the divisor, 4 3 3 7, the ones you are crossing out. What are they for? Those are the carries during the multiplication (see my article on binary multiplication). For 9 * 88, 9 * 8 = 72, so write the 2 and carry the 7; for 4 * 88, 4 * 8 = 32, so write the 2 and carry the 3; etc. Thank you so much! I used it as model for a microcontroller routine of an electronics project. You didn’t say what you need help with, but if you just want the answers, try my binary calculator.